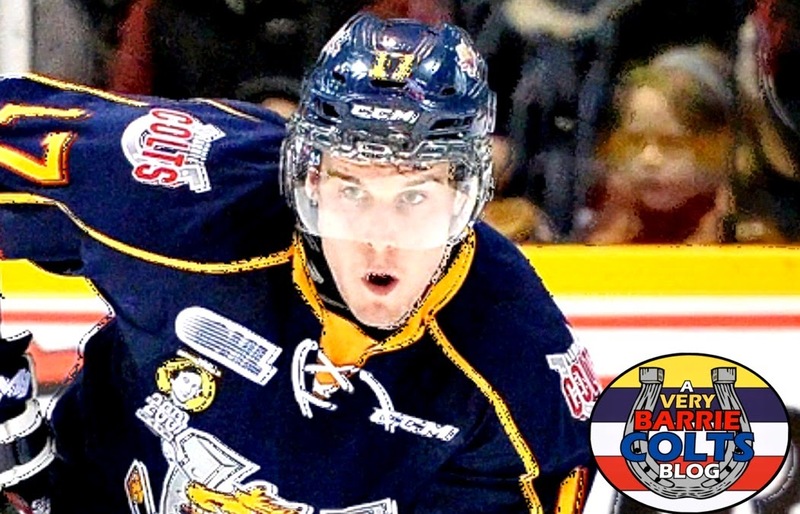 Justin Scott: Developing 'Just in Time' for the @OHLBarrieColts! #OHL (@justinscott95) - Very Barrie Colts | A website covering the Barrie Colts of the OHL. Justin Scott has had an INCREDIBLE season for the Barrie Colts. Right now the Colts are very top heavy. Their top 6 forwards are filled with so much skill and Justin Scott has been a huge reason for that. Ask fans of other teams and they will for sure say that Blandisi and Labanc are the teams skilled guys. Fans paying more attention will talk about how over looked Mangiapane is. Lemieux is obviously another huge piece to the teams success up front but there is one question here that you need to be asking yourself. Is there a more over looked player on the Colts than Justin Scott? We are not going to answer this question for you but lets take a look at a few things here. In 55 games this season, Scott has put up 45 points. 24 goals and 21 assists. And this isn't a guy who has been known for putting up these kind of numbers with the team. In fact, he has made huge strides in terms of production. Playing his 3rd season with the team, in his previous 2 seasons he put up 29 points combined. With more than 10 games remaining in the season he could double his point total from the past two seasons this year alone. That alone says a lot about how his game has grown. Scott gets to play with great players but that isn't the only reason he is having such a great season. Scott is a very smart player with great positioning and is able to use his size to fight for rebounds in the crease. Scott isn't the biggest guy but if you have seen him live you probably noticed that he seems a lot bigger than his player bio would have you believe. He also uses that size to be a aggressive forward. Not only is he aggressive but he usually is able to keep that style within the rules of the game, only spending 35 minutes in the penalty box for minor penalties. His PIM per game average is .64 which is not only one of the lowest on the team but also the lowest of the top 6 forwards. Remember, this is the highest penalized team in the OHL and discipline is something we need to try to embrace more. Scott is one of the few guys doing this. His 45 points are the 6th most on the team and he has the best +/- on the team with a +29. Mangiapane is the second highest of forwards with a +20. Why is this important? Mangiapane has 40 more points than Scott does. This tells us that not only is Scott scoring goals but when he is on the ice the other team is rarely scoring at all even compared to that of other top players on the team. Another thing to look at is of Scott's 24 goals this year, only 1 is on the power play. That means 23 of his goals are scored even strength with the exception of two which were short handed goals. Lets compare this to other top scorers on the team. Blandisi has 40 goals;10 on the PP. Labanc 24 goals; 12 on the PP. Mangiapane 36 goals;16 on the PP and Lemieux has 37 goals;24 on the PP. This tells us that with 5 on 5, Scott has the second most goals on the team. Makes you wonder how his numbers could be with him on the top PP unit? So, Scott is not only scoring but he is contributing by not letting the other team score and the majority of his production is when the team is full strength. So as we asked earlier. Is there a more over looked player on the Colts than Justin Scott? Let us know in the comments, on our Facebook Page or on Twitter! Scouts would be wise to have a closer look at this kid.